Porcini, Shiitake, Nameko, and Button mushrooms. To accentuate the flavor of our mushrooms, we only use the finest ingredients available. Four Mushroom Gourmet Salad contains Sea Salt, which is evaporated seawater and a gourmet version of regular table salt. Its superior taste are a perfect compliment to the rich mushrooms in our gourmet salad. 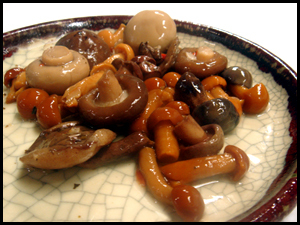 Vinegar, another ingredient in our Four Mushroom Gourmet Salad that is useful for smart diet. Our salad also contains Acetic acid, which gives vinegar its strong distinctive taste and smell. It also has Citric Acid, which works as a natural preservative and adds a sour taste. Garlic, besides having a distinctive taste, is also known for having nutritive properties. Basil is a popular herb that is often considered "king of herbs." Oregano has an aromatic, warm and slightly bitter taste. 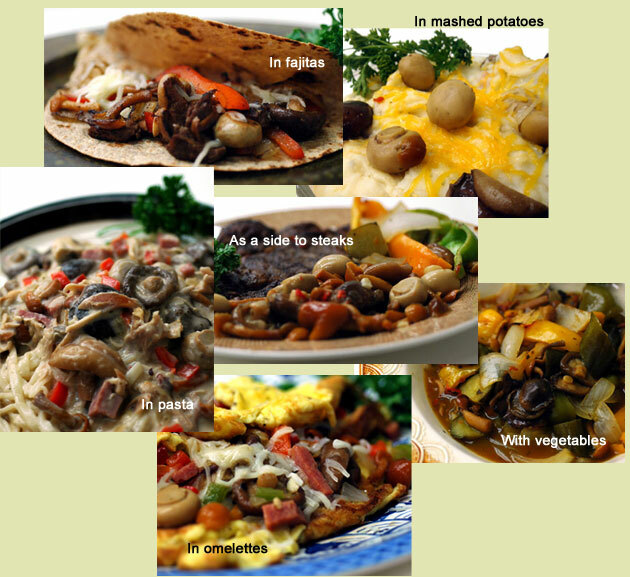 Four Mushroom Gourmet Salad works in a variety of dishes, as a main entree or as a side.